Mom & Dad M. were in Korea last week! It was an amazing week filled with walking, hiking, and of course, card playing. The first day they were here was the second to last day of the Gwangju Kimchi festival, which could not be missed for a visitor to Korea. So on day one they got an overload of the national dish. 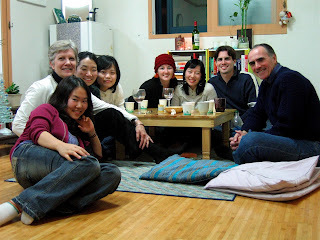 Though Koreans often believe it's not palatable to Westerners, we really enjoyed it. Although by the 7th or 8th stall, I think their tongues were getting spice-weary. let the culling begin . . .
Over the past week the bird flu came to Korea. When we first arrived in Korea, the newspapers touted the "kimchi cure", which was essentially to eat kimchi. Some farmers even fed kimchi additives to their chickens/ducks and other livestock, companies began developing air conditioners that would emit an enzyme found in kimchi, and the new-age movement (called "Well-being" here) began supplying the masses with material meant to increase the purchase power of their "well-being" kimchi products. At least kimchi's still delicious. On a recommendation from friends, Alex and I ventured to Gwangju's Art Biennale, and now we can officially recommend it, too! Here are some photo highlights. The road to praising communism is paved with good intentions? 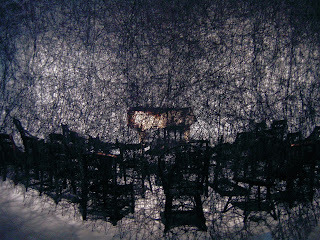 Last weekend while enjoying some truly fantastic art at the Gwangju Art Biennale. Thoughtful, dramatic pieces. Meditative pieces and glittering spectacles of art. But in the 5th gallery, titled "U.S.'s Imperial War", was an exhibit that catered to the growing anger at America, and it gave me pause. Not because I cannot conceive of hatred towards America. I can. I just couldn't follow this artist's conclusions. He aligned his political philosophies with communist China and guerrilla soldiers in Venezuela. He touted the failures of a democratic system while supporting China’s communist hero, Mao Zedong. Never mind that an earlier exhibit showcasing China's doctored photos to paint communism in a favorable light, or that in a communist society his rights are not so protected or that he, in fact, lives in America. Never mind, indeed.